Clark Gable as Rhett Butler and Vivien Leigh as Scarlett O'Hara. 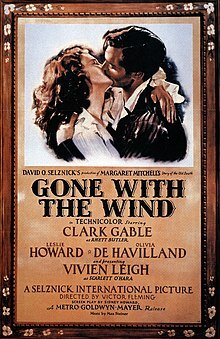 Gone with the Wind is a 1939 film about a strong willed woman and a roguish man who carry on a turbulent love affair in the American south during the American Civil War and Reconstruction Era. It is one of the most popular love stories ever written. Directed by Victor Fleming. Written by Sidney Howard, based on the novel by Margaret Mitchell. All we've got is cotton, and slaves and... arrogance. I believe in Rhett Butler. He's the only cause I know. The rest doesn't mean much to me. I'm very drunk and I intend on getting still drunker before this evening is over. As God is my witness, as God is my witness they're not going to lick me. I'm going to live through this and when it's all over, I'll never be hungry again. No, nor any of my folk. If I have to lie, steal, cheat or kill. As God is my witness, I'll never be hungry again! Note: bolded portion is ranked #59 in the American Film Institute's list of the top 100 movie quotations in American cinema. I can't let him go. I can't. There must be some way to bring him back. Oh, I can't think about this now! I'll go crazy if I do! I'll think about it tomorrow. But I must think about it. I must think about it. What is there to do? What is there that matters? Tara! Home. I'll go home. And I'll think of some way to get him back. After all... tomorrow is another day! Note: bolded portion is ranked #31 in the American Film Institute's list of the top 100 movie quotations in American cinema. Scarlett: He looks as if... as if he knows what I look like without my chemise. Charles: You can't mean you don't want war! Gerald: [the other men protest] Now gentlemen, Mr. Butler has been up North I hear. Don't you agree with us, Mr. Butler? Rhett: I think it's hard winning a war with words, gentlemen. Rhett: I mean, Mr. Hamilton, there's not a cannon factory in the whole South. Rhett: I'm afraid it's going to make a great deal of difference to a great many gentlemen, sir. Rhett: No, I'm not hinting. I'm saying very plainly that the Yankees are better equipped than we. They've got factories, shipyards, coalmines... and a fleet to bottle up our harbors and starve us to death. All we've got is cotton, and slaves and... arrogance. Rhett: Well, I'm sorry if the truth offends you. Charles: Apologies aren't enough sir. I hear you were turned out of West Point, Mr. Rhett Butler. And that you aren't received in a decent family in Charleston. Not even your own. Rhett: I apologize again for all my shortcomings. Mr. Wilkes, Perhaps you won't mind if I walk about and look over your place. I seem to be spoiling everybody's brandy and cigars and... dreams of victory. Scarlett: Don't tease me now. Have I your heart, my darling? I love you. I love you. Scarlett: Why don't you say it, you coward? You're afraid to marry me. You'd rather live with that silly old fool who can't open her mouth except to say yes, no, and raise a passel of mealy-mouthed brats just like her! Scarlett: Sir, you... you should have made your presence known. Rhett: And you, miss, are no lady... Don't think that I hold that against you. Ladies have never held any charm for me. Rhett: Don't start flirting with me. I'm not one of your plantation beaux. I want more than flirting from you. Rhett: I'll tell you, Scarlett O'Hara, if you'll take that Southern-belle simper off your face. Someday I want you to say to me the words I heard you say to Ashley Wilkes: "I love you!" Scarlett: That's something you'll never hear from me, Captain Butler, as long as you live. Rhett: I thought it was about time to get you out of that fake mourning. [shows her how to wear it after she places it on backward] The war stopped being a joke when a girl like you doesn't know how to wear the latest fashion. And those pantalettes: I don't know a woman in Paris who wears pantalettes any more. Scarlett: Oh Rhett, what do they — you shouldn't talk about such things. Rhett: You little hypocrite. You don't mind my knowing about them, just my talking about them. Rhett: I might be... if the right moment ever came. Rhett: I'll tell you why, Scarlett. Because I'm the only man over sixteen and under sixty who's around to show you a good time. Rhett: I want you to faint. This is what you were meant for. None of the fools you've ever known have kissed you like this, have they? Your Charles, or your Frank, or your stupid Ashley. Rhett: Did you ever think of marrying just for fun? Scarlett: Marriage, fun? Fiddle-dee-dee. Fun for men, you mean. Rhett: Yes, ma'am. A man who understands you and admires you for just what you are. I figure we belong together, being the same sort. I've been waiting for you to grow up and get that sad-eyed Ashley Wilkes out of your heart... Are you going with me or are you getting out? Scarlett: I hate and despise you, Rhett Butler. I'll hate and despise you till I die. Rhett: [amused] Oh no you won't, Scarlett. Not that long. Rhett: What collateral are you offering? Rhett: What would I do with a farm? Scarlett: Oh, you wouldn't lose. I'd pay you back on next year's cotton. Rhett: Not good enough. Have you nothing better? Rhett: You haven't forgotten. I'm not a marrying man. Scarlett: No, I haven't forgotten. Rhett: You're not worth $300. You'll never mean anything but misery to any man. Scarlett: [as he is about to leave to join the Confederate Army] Oh, Rhett! Please, don't go! You can't leave me! Please! I'll never forgive you! Rhett: I'm not asking you to forgive me. I'll never understand or forgive myself. And if a bullet gets me, so help me, I'll laugh at myself for being an idiot. There's one thing I do know... and that is that I love you, Scarlett. In spite of you and me and the whole silly world going to pieces around us, I love you. Because we're alike. Bad lots, both of us. Selfish and shrewd. But able to look things in the eyes as we call them by their right names. Rhett: You're right, my dear. I'm not in love with you any more than you are with me. Heaven help the man who ever really loves you. Rhett: Of course, the comic figure in all this is the long-suffering Mr. Wilkes! 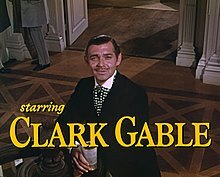 Mr. Wilkes, who can't be mentally faithful to his wife — and won't be unfaithful to her technically. Why doesn't he make up his mind? Rhett: Observe my hands, my dear. I could tear you to pieces with them, and I'd do it if it'd take Ashley out of your mind forever. But it wouldn't. So I'll remove him from your mind forever this way. I'll put my hands so — one on each side of your head — and I'll smash your skull between them like a walnut, and that'll block him out. Scarlett: I'm not cornered. You'll never corner me, Rhett Butler, or frighten me. You've lived in dirt so long you can't understand anything else and you're jealous of something you can't understand. Rhett: Indeed. And who is the happy father?" Scarlett: You know it's yours. I don't want it any more than you do. No woman would want a child of a cad like you... I wish for anybody's child but yours. Rhett: Cheer up, maybe you'll have an accident. Rhett: I'm leaving you, my dear. All you need now is a divorce and your dreams of Ashley can come true. Scarlett: Oh, no! No, you're wrong, terribly wrong! I don't want a divorce. Oh, Rhett, but I knew tonight, when I... when I knew I loved you, I ran home to tell you, oh, darling, darling! Rhett: Please don't go on with this. Leave us some dignity to remember out of our marriage. Spare us this last. Scarlett: This last? Oh, Rhett, do listen to me, I must have loved you for years, only I was such a stupid fool, I didn't know it. Please believe me, you must care! Melly said you did. Rhett: I believe you. What about Ashley Wilkes? Rhett: You certainly gave a good imitation of it, up till this morning. No, Scarlett, I tried everything. If you'd only met me half way, even when I came back from London. Rhett: And then when you were sick, it was all my fault... I hoped against hope that you'd call for me, but you didn't. Rhett: It seems we've been at cross-purposes, doesn't it? But it's no use now. As long as there was Bonnie, there was a chance that we might be happy. I liked to think that Bonnie was you, a little girl again, before the war, and poverty had done things to you. She was so like you, and I could pet her and spoil her, as I wanted to spoil you. But when she went, she took everything. Scarlett: Oh, Rhett, Rhett, please don't say that. I'm so sorry, I'm so sorry for everything. Rhett: My darling, you're such a child. You think that by saying "I'm sorry," all the past can be corrected. Here, take my handkerchief. Never, at any crisis of your life, have I known you to have a handkerchief. Scarlett: Oh, Rhett! [watches Rhett walk to the door] Rhett! [runs down the stairs after him] Rhett, Rhett! Rhett, Rhett... Rhett, if you go, where shall I go? What shall I do? The bolded portion ranked #1 in the American Film Institute's list of the top 100 movie quotations in American cinema.